The winding Souris River crosses the Canada-US boundary in two places, flowing from Saskatchewan to North Dakota before turning north into Manitoba. 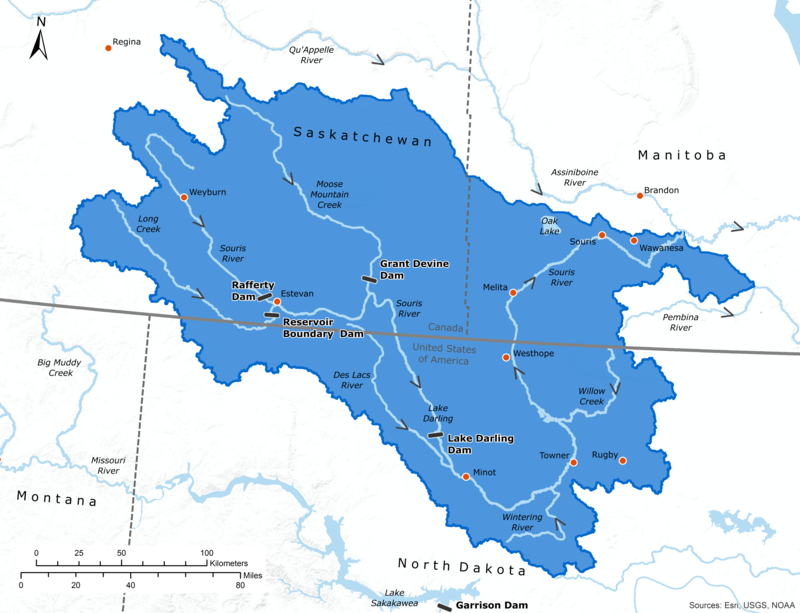 The 700 km (435 mile) long river is home to a variety of fish species, and runs through a variety of cities and towns, such as Minot, North Dakota, and Weyburn, Saskatchewan, where it provides a water source. The soil in the Souris River basin is ripe for agriculture, and waters from the river are apportioned according to an IJC Order, which created the International Souris River Board. The board also monitors water quality in the river. The International Souris River Board ensures a more eco-systemic approach to transboundary water issues, compliance for the apportionment of river flows, oversight of flood operations, and assists the Commission in preventing and resolving transboundary disputes. The Study Board was appointed by the International Joint Commission to investigate flooding and water supply issues in the Souris River basin.